Departing from Iquitos on January 6, 2020. 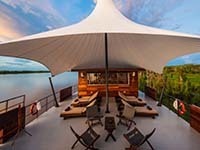 The striking black hulled ship Aria Amazon allows guests to explore the Peruvian Amazon in utmost comfort, safety, and style ensuring smooth travel and safety as you discover the incredible wildlife and exotic culture of one of the world's most remote and rugged parts of the world. 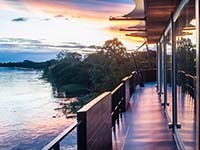 Highly experienced river pilots and four English-speaking naturalist guides complete each Amazon adventure. 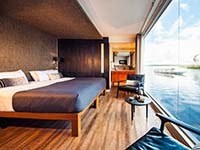 Completely refreshed with new upgrades from bed linens to state of the art lighting to extremely generous dining and lounging areas that allow for stunning views of this unique landscape, the Aria Amazon is this river's premier vessels. 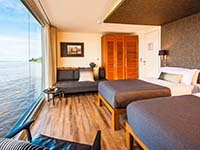 You can relax in an outdoor river facing Jacuzzi on deck, enjoy floor to ceiling windows in every stateroom that face the Amazon River in the ship’s 16 Design Suites–four of which can interconnect for families–and upgrades to the spa include new decor for enhanced relaxation. Designed to balance the stunning scenery, the refined interior of the Aria Amazon dining room has been stylishly finished with contemporary Peruvian art, fine china, and crystal glassware. 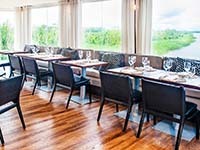 These aesthetic elements are matched by attentive, personalized service from long-serving staff that quickly learn guest names and tastes, from Peruvian coffee in the morning to the evening's fine South American and European wines. Chosse to dine à deux, or family style among new friends. Whatever dishes you choose among Schiaffino's fresh, ever-changing modern Amazon jungle influenced menus, perhaps the hearts of palm soufflé followed by an Amazon bass tiradito, do save room for dessert, be it a warm banana tart or classic chocolate fondant. 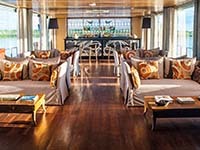 Nature takes care of the lighting on the generous outdoor deck on the Aria Amazon, with plenty of sunshine for those who wish to soak it up on cushioned loungers during the day to cooler evenings under the star-filled sky. Guests seeking fresh Amazon air without being exposed to the sun will find plenty of space and comfortable seating under the expansive awning of the outdoor lounge. Floor-to-ceiling panoramic windows on both sides confer a seamless connection to the ever-changing scenery of Amazonia from this spacious living room finished with wood flooring and soft lighting. Relax over homemade plantain chips and cocktails, or South America's finest wines in this air-conditioned comfort among the plethora of plump couches. Coffee table books about Peru and the Amazon are available for perusing, and most days will include an educational discussion held here. These entertaining forums on relevant topics to the day's adventures, from endangered Taricaya turtle repopulation to the secrets of mixing a perfect pisco sour, are open to all and led by English-speaking naturalist guides. The Observation Deck on the Aria Amazon’s top level is complemented by the Indoor Lounge, with its fully stocked bar at one end and tightly edited library at the other, fresh Amazon flowers, and unique artifacts in between, beckons lounging on its well stuffed cream sofas on polished timber floors under high ceilings. Outside, cushioned loungers under a soaring canopy encourage the relaxing indulgence of river gazing without concern for the sun’s glare. Or ease into the outdoor Jacuzzi to cool off after a shore excursion in the sultry rainforest.